Remember a few weeks ago when I told you all about our love of whole foods (with a healthy outlook on dessert!) and presented you with a two-week Eating Clean challenge? Did any of you make time to do it? Now that Thanksgiving is over but Christmas is still a few weeks away, it’s the perfect time to take the challenge if you haven’t yet. I thought I’d share how the challenge went for me personally. My goal was to lose a little weight. So I ate no sugar and was aware of my portions, on top of the whole foods only. After the two weeks I dropped five and a half pounds. I didn’t exercise at all during those weeks (we did go on a walk one day, but that was it!). But now that it’s been a week (and Thanksgiving happened) I’ve gained about half of the weight back. That’s really normal for me. When I reintroduce sugar my body hoards it. My body is excellent at hoarding calories. 🙂 I would also say that I’m generally happier and have more energy when I choose to kick sugar and eat well. Most of the recipes I shared were mine and things that I’ve been making for a long time. A few, however, were new-to-me recipes. I made new-to-me steak carnitas meat in the crockpot and it was probably my favorite meal from the entire two weeks. We enjoyed the leftovers for a few days, and I just got everything to make them again this week. They were amazing and so so easy. Gotta love that. I used the meat in soft tacos, hard tacos, tostadas, and on nachos… can’t beat meals like that. Hey, they are clean! Well, I’m gearing up to do my two week challenge again before Christmas (which should mean a sustained five-pound weight loss during the holidays for me. Yes!). Now that I’ve got you excited I want you to do it with me. Who’s in? We can make a FB page or something to help each other out and get motivated. I’m serious, I do so much better when I have a support group. Let’s do it! Mix all of the spice together in a small bowl for the spice rub. Rub the spices into each side of the steak, using all of the mixture. Place the spice rubbed-steak in the bottom of the crock pot. Place the chopped onion, bell pepper, and jalapeno on top of the steak. Cook for on low for 7 to 8 hours. After the cooking time has lapsed, remove the steak from the crock pot and shred with two forks. Serve immediately or return to the crock pot for a few hours until you are ready to eat. Serve on corn tortillas with your favorite topping. Flank steak is generally a tougher, and therefore cheaper piece of meat. It’s a great candidate for the crock pot. I actually have used everything from elk steaks, lamb, and pork and loved them all in this recipe. Use what you have on hand or what’s on sale… if it’s a leaner cut of meat you may need to add a bit of beef stock at the end to make sure it doesn’t dry out before cooking. 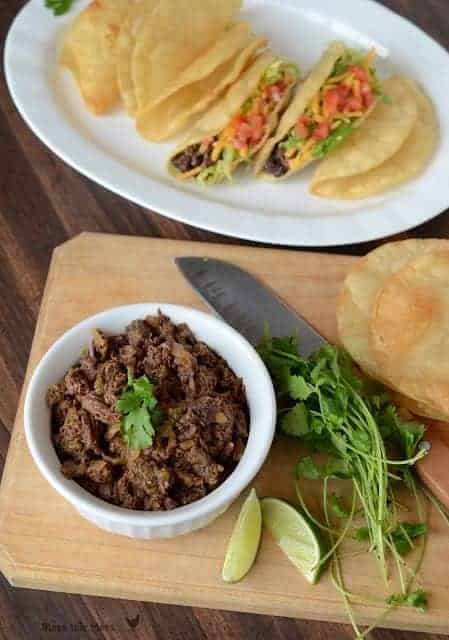 Jenna (from Eat, Run, Live) who originally made the recipe had some great serving suggestions for these steak carnitas too. Seriously, let me know if you want to eat clean together. How about starting the first Monday in December? We’ll begin with steak carnitas! I’m excited! Ohhhh! This recipes looks good! I will join you! We try our best to eat whole foods anyway! Ok you’ve convinced me… I need a crockpot! Yum! Between these and broccoli cheese soup! 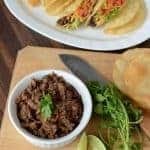 you need to link you taco shells to this page. oh yum I really want to fry up some corn taco shells! We have been following your 2 week plan for our resolution to eat clean! This is the recipe I’m making today! I love that you use your left-overs for other meals too–thanks for doing the planning for us! Hi. What’s a crockpot? Is it a cast iron pot that goes into the oven or an electric slow cooker? (I’m from that foreign speaking place- the UK ;)) I am really excited about your 2 week plan. Maybe you could include a shopping list! I know its a cheeky request! 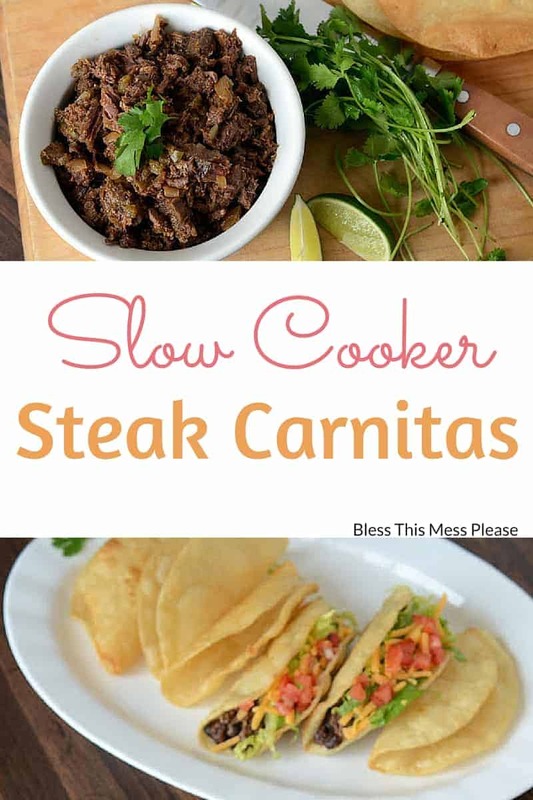 An electric slow cooker is what I used in this recipe… do you have access to one?! This recipe looks delicious. I am always looking for new healthy slow cooker recipes. I have set some goals to eat healthy and workout and creating this plan has really helped me reach my goals. It is about setting goals and sticking to them and there are some great support tools to help you succeed. I have to ask, I cook with my slow cooker all the time and always use liquid. Should there be a liquid, or is it really just the meat and veggies? This looks delicious, but I’m worried about that detail. 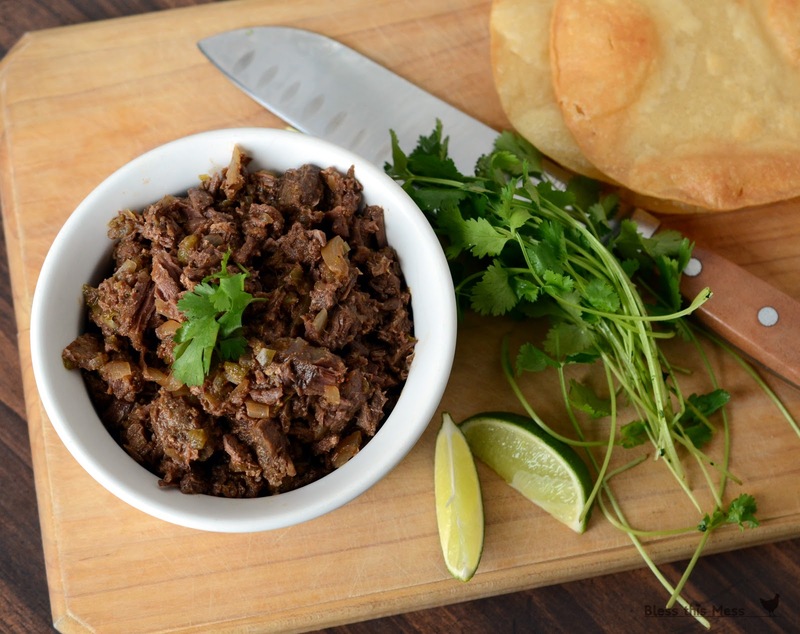 Did you fry the corn tortillas in this recipe? It looks delicious! Awesome! Thanks! I love this blog btw. 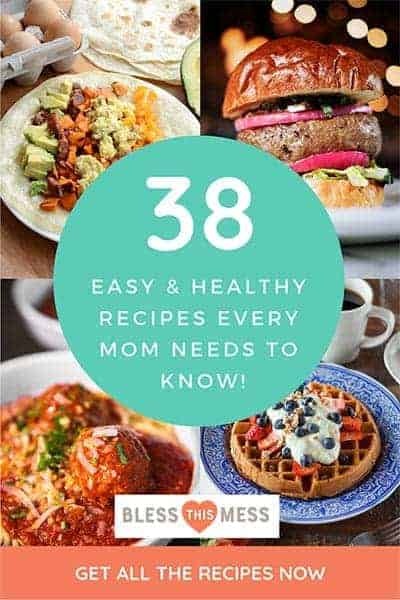 I stumbled on it via pintrest and I think i pinned almost every recipe I coukd. I love to cook and everything looks amazing! Thanks so much Katie. Today’s my Birthday and you totally just made it great! This is such a fabulously delicious recipe!!!! Thanks for sharing and giving me the best idea for making elk! I used so much elk making this recipe… it’s really such a great use for it! And I made it for so many people and just never mentioned it was game meat! No one could even tell 🙂 So glad you liked it! Does the meat need to be frozen or thawed out?! I’ve done it both ways… the spices on the outside sink in more when you start with a thawed piece of meat but if you are short on time I’d still do it frozen. And of course the cooking time is a longer with a frozen piece of meat. Enjoy! Do I put and water in the crock pot? Can you freeze this? If yes before or after you cook? I think that you could do either… I make it and then freeze the extra already cooked meat to pull out and heat up for a quick dinner! Or you could get it all ready, freeze it, and then dump it in the crockpot on the day you are planning to have tacos. ENJOY! I just made this tonight and we all love it. I’ve been looking for a great steak/carnitas recipe for awhile and making it in the slow cooker was almost effortless. since its in the slow cooker could you use a cheap cut roast? Its hard to find flank steak where i live , was thinking maybe eye of round is lean and might work too? Yes, yes, yes!! I have used all kinds of lamb, beef, and pork roasts with great success! If I think the roast is extra lean that I might add a can of diced tomatoes (with the juice) for a little extra liquid so that it doesn’t dry out or I’ll adjust the cooking time until it is done and tender. I’d for sure make it with whatever you have on hand…. it’s delicious and easy! This looks great, and I’m totally going to try it, but “carnitas” = pork, so you should probably edit the name of the dish. Carnitas literally means “little meats”, so steak carnitas are little beef meats! I’m hungry just writing that. Sure they are traditionally pork, but steak is really good too! So you don’t put any liquid in the crockpot? The meat makes it’s own juice! If your crock pot says that it needs liquid (they differ) then I’d add a can of diced tomatoes! I actually managed to cram my 2 lb. roast into my 2 qt. crock pot! It smells great. My only worry is that it may not be done until late. I started the heat at 1 PM. I turned it up to high at about 4. I’d love to be in on your eat clean group!!! Except I’m about 2 years behind. 🙂 Thanks for your recipes. You are amazing! LOL, yep, a little late. BUT I’ll probably do another group soon! I’ll let you know if I do. Thank Jessica! Hi Melissa 🙂 Could you use chicken or turkey with these spices do you think? 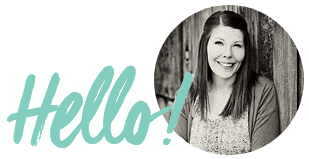 I’m loving your two week summer menu plan! Thank you! Yes, for sure! I have made it with everything from elk and venison to chicken and pork. It works great! If the meat is on the lean side you might want to add a little chicken stock or something so that it doesn’t dry out while cooking. Enjoy!!! I tried to read through the thread to make sure this isn’t a repeat question…So, when buying meat, provided you are choosing store bought for the occasion, do you have any tips? I try to buy organic when i can, but flank steak is harder to find. I’m wondering if you know of farms you trust or anything that can help a girl out with one hungry husband and a growing boy staring back at me every night I try a meatless meal. 🙂 thanks in advance. I don’t buy much meat at the store anymore, but if I were I’d just buy what is on sale. Pork and beef roasts are both great in this recipe, and I think beef is generally easier to find organic if that’s something you are looking for. I’m not sure if that helps… does it?! Let me know! What are the shells/tortillas in the picture? Are they homemade or store bought? They look delicious! Wonderful. Thank you! I will definitely be giving these a try. I am doing your 2 week clean eating plan and loving the different meal ideas. For breakfast daily I have done oats in mason jars and for lunch i have done salads in mason jars. I am having to google a few things like these carnitas as we have never heard of them before in New Zealand. I have the steak slow cooking now and it smells delish! Roll on 2 hours and we can eat them! Yay!!! It was so nice of you to comment and tell me, THANK YOU! And how did the tacos turn out?! That’s one of our all time favorite recipes. Absolutely divine! Plenty left for tonight’s dinner! Also made the Thai Green Curry last night & I have been to Thailand & i could have sworn I was back there eating it! Thanks again! My husband is Latino, and a picky eater. It’s hard to find recipes that he really likes. I recently decided to make this for him. The picture and recipe are showing up all jumbled. I can’t read the spices, could you reply here with them. I think I can make the rest of it out. Love Carnitas! Thanks for letting me know! I’m not sure what happened but I think I fixed it. Can you see the recipe right now??? Melissa, how did you prepare your corn tortillas? They look so good. I just heated mine in the microwave ans they broke into pieces and didn’t taste very good. The meat was DELICIOUS!!!! Here’s my tip- if you don’t mind frying, do that (an inch of oil in a little skillet, fry for a few seconds on each side). If that isn’t your thing you can get the skillet pretty hot (medium high) and then spray it with cooking spray. Add the tortilla and then spray the top of the tortilla with a little more cooking spray. Flip over and cook about 30 seconds on each side. I do both of these often depending on my mood and how many calories I want to consume. Fried is delicious but the second option is still really good with less hassle and calories. You’ll like it much better than the microwave! Does the meat turn out moist? I feel like you need some liquid or it is going to yield shoe leather . From experience , does it turn out famously with no liquid? I’m only going to have about 4 hr can I cook on high for 4hr? Can you use this same recipe with chicken breasts? Or any changes in the spices. I can’t wait to try it. I don’t think it would been to be cooked as long since they don’t generally have bones. I’d check the meat after maybe 25-30 minutes so that it doesn’t over cook. I mean as far as the seasonings. I like shredded chicken for tacos,burritos and enchiladas. Gottach now! Nope, I don’t change a thing and I do make this with chicken occasionally (still just don’t over cook), it’s very good! The chicken gets a little dry in the slow cook so sometimes I’ll add a little chicken stock or even some tomato juice to the bottom of the slow cooker so it has a little liquid to cook in. You are going to love it.